Napoleon - I think capturing the scout rather easy. Put two pieces at E8 and F8 and move other two pieces up the right side side by side forcing scout back and then to the left. Once the scout is past E 3 and 4 to the left its dead. If it flies back to A8 - move E8 to D8. Then move F9 to E8 (two moves as it would take two moves for scout to get to 9B to try to escape). If it moves to C9 then move D8 to C8 and its now effectively captured. From E8 any rush by miner to flag can be intercepted and killed - yes you'd then have to reset your capture and it takes time but I think its pretty straight forward. Assuming your starting position are a8 e8 f8 and i8 and you move all up then you are right but only if he is not in column j at that time, otherwise he could always escape from below to above the lakes and vice versa. During my spare time last year I made a setup editor for Stratego. My original purpose for it is to help me work on a book on Stratego, but that project is moving forward very slowly. The editor can help if people want to fast make puzzles or setup boards to recreate game situation. Perhaps it is interesting to you guys? I recently added a few new features to it including the field numbering and lettering and options to have unknown and unmoved pieces for both blue and red. Napoleon, No need to cover column a if your at E8. Use the other two to walk him back to his side and then over to the left. Quizz N°9 by Napoleon 1er - 3 miners and 1 marsh against 2 major pieces, spy and marsh - who should win? This quizz is the situation I had (as blue) in my last game against Alister777 (red) who won 22 points ... which I have been "happy" to lose because he gave me an excellent stratego lesson and a good case for a quizz. In the below situation Alister777 moved his lieutnant from G2 to H2 and then I made a move which caused my defeat. What should in fact be the tactics and logical sequence of moves for blue to get a clear victory? I would say that miner in the middle is key to getting things done. Your marshall is being blocked by the spy so that one is useless. ... that's a good start but still how do you ensure being able to visit all 4 "u"? First you take the u with the miner. Then i assume he will bring his marshal over to capture the piece, you move the miner through the middle and move it towards the spy, his spy moves and you get into the position like this: his marshal: E2 His lieut H2 Your miners: F1 and D3. You then move then you must try some, you forced his spy back already with the miner in the middle if you played it well, so you could move the marshal forward a bit. You can then offer the most right miner to get a hit on the most right bomb, and you can pressure the captain to go back with the marshal, he will have to retreat. Anyway, I am sure i would have finished this one, thanks for the games! 4. if you had 2 scouts how many additional pieces would you need to capture 1 scout? 5. if you had just the minimum amount of pieces needed (no scouts) to capture 1 scout but 1 of the pieces of yours was a spy instead would winning be certain? what if 2 of your pieces were spies (if you had that many)? How many (maximum) of the pieces could be spies to have certain victory? 6. how many (minimum) non-spy/scout would you need to capture one scout if your opponent has bad strategy? (bad strategy is defined as not making the BEST move possible, not something like only moving multiple spaces when threatened or attacking a piece) just think of different strategy levels and determine different amount of pieces needed for them I understand bad strategy is very vague and not definite. you shouldnt have acctepted the draw the maximum pieces you need to capture a scout is 4. in your case you could have easily capture his scouts one by one. the minimum pieces you need depends on the situation . 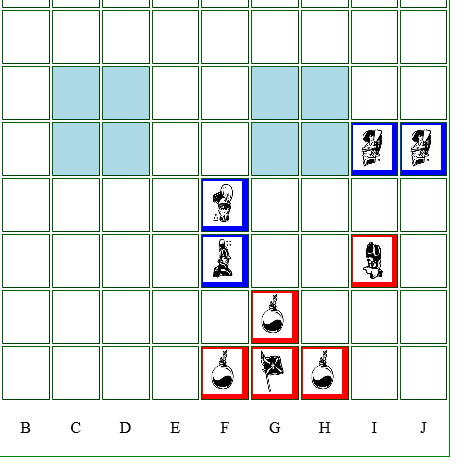 I under stand that if you get to this position you can close in and capture scout(s) but you have to move 4 pieces one at a time while your opponent only has to move one pieces multiple squares at a time. the scouts just could evade too easily; so you will never get to this position if your opponent is the slightest bit decent. Thank you theeasys8 for this question. Yes with both flag sealed and no miners left who has 4 major pieces left has a clear victory whatever the other has left. If the other pieces are not scouts they can be trapped one after each other with 2 major pieces. In case the other pieces are scouts you need 4 pieces to trap the scouts one after each other by following example of quizz 8 above. But it depends also how the bombs are positioned. If you have a bomb disposition like in quizz 5 above you will need only 3 major pieces to capture the last scout. And if the last scout is already "trapped" in a bombed corner possibly you need only 2 or only 1 major piece to capture it. I tried to post a problem that I 've thought recently. While I was trying to post the image , I messed it up. So in order to explain it, I'll use words. In the top left corner there is a sealed flag(blue) and in the bottom right there is a flag surrounded by 2 scouts(red). (Blue) also have 2 scouts randomly in the field. Could you find the proper strategy for Blue to win the game? Thank you very much for the quizz but I guess it would be easier to understand if we have a picture of the board. I used to make them on excell and then save a pic as jpeg from Paint so i can upload on imgur and paste the link on the forum. but interesting is what happens if red has to move? Can red ensure draw? and if yes can he do it without double chasing? Well Actually when I invented it, I didn't know that the 2 square rule occurs even on scouts. Assuming that there isn't 2 square rule, Blue does have another winning tactic in the first case. Blue also wins, even if Red plays first!I've found that there is also a little tactic to evade double chasing.